A delicious, easy, and different weeknight meal the whole family will love! 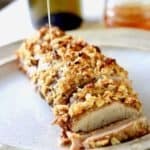 Place pork loin on foil lined baking sheet. Pat with paper towel to remove excess moisture. Mix garlic/brown sugar/salt/pepper/olive oil together in small bowl until mixture becomes paste-like. Spread mixture on top of pork loin. Bake for 35 minutes, or until your pork reaches an internal temperature of 145 degrees.Slice, and enjoy! Note: The sugar may bubble up and turn dark on the baking sheet, however it will not burn the pork loin itself.